The cabinets in our house are the originals from 1970. They were totally open on the inside which was an organizational nightmare. 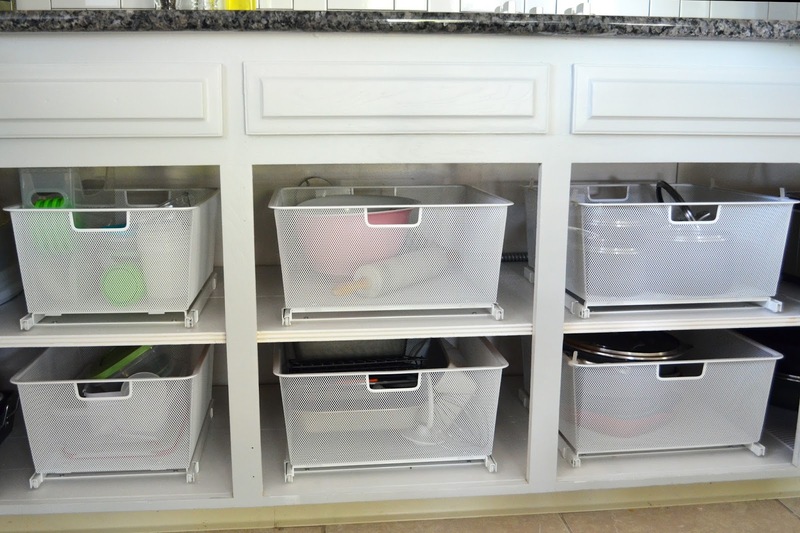 Everything just sort of had to be piled in, and when you wanted something in the back, you had to move everything out of the cabinets to get to what you needed. Getting new cabinets was not an option because we didn't want to over-renovate for the neighborhood, and there is no way we'd make back the cost of a completely new kitchen when we move in a few years. 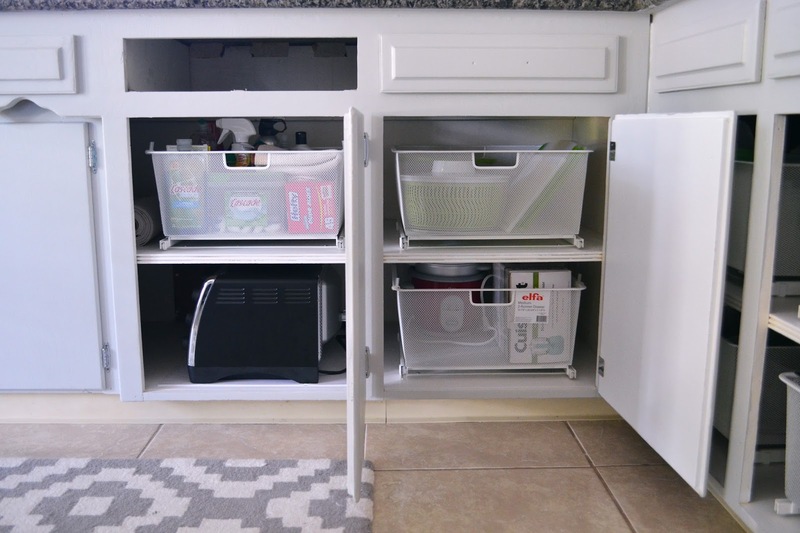 I'm pretty OCD when it comes to organization, so I set out on a search for an affordable solution to make the cabinets more livable. 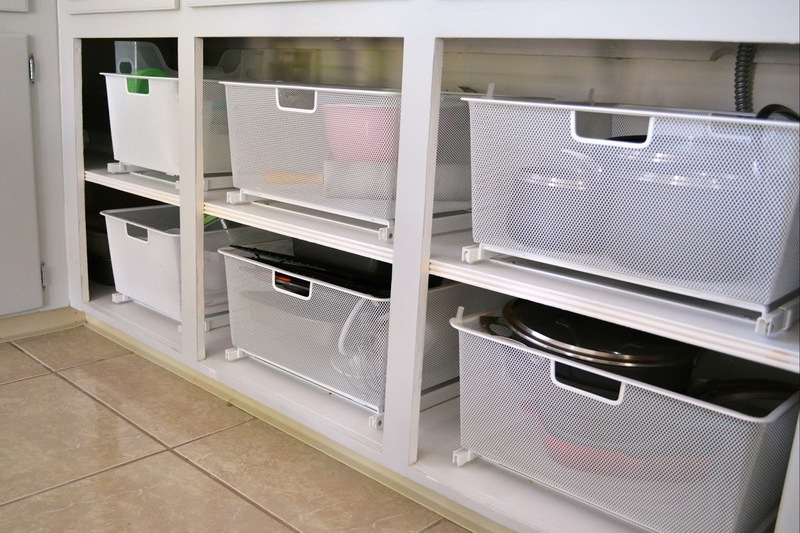 I found a bunch of options online and at the hardware stores, but the ones I found to work the best for me were the Elfa Easy-Glider Drawers. I loved that they were white mesh so I could see what was in them, but they still kept everything looking clean and organized. Most other systems I found were metal or wood, which would look messy or wouldn't match the newly painted white interiors of the cabinets. This was before we had finished putting on our cabinet doors and after I had just unpacked. They're even more organized and functional now! The Container Store is currently having their annual Elfa sale, so right now these drawers are a great deal. I wish I could have waited for this to purchase mine, but I was desperate to have functional cabinets! To see our completed kitchen remodel, check out this post!